Defect-free aluminium containers with machine vision from STEMMER IMAGING. The Switzerland based, Leuthold Mechanik AG (HLM) builds machines that manufacture aluminium containers used for pet food packaging. This video covers how machine vision solutions from STEMMER IMAGING help to control the quality of each aluminium container. 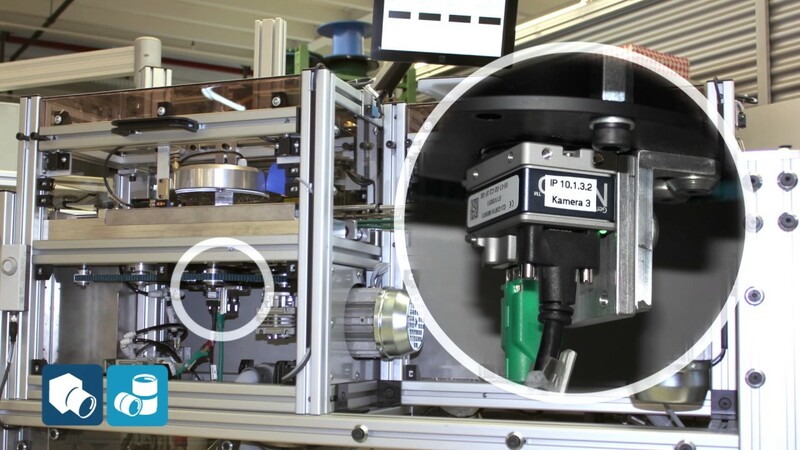 Video: Defect-free aluminium containers with machine vision from STEMMER IMAGING. Unremittingly, 120 times a minute over three shifts the ram on the press in the HLM Competence Centre rises and falls and after every stroke spits out four finished pet food containers. A machine like this thus produces 480 high quality aluminium containers per minute, which will later be filled with pet food. There are several reasons for using aluminium as the material for such containers: For one, this material is gas-tight, which means that the contents can be stored for much longer. Furthermore, aluminium can be recycled and consequently is more sustainable than plastic, which is not gas-tight and also cannot be classed as harmless from a health point of view, due to the addition of plasticisers. The aluminium cans are also coated, so that the foodstuffs do not have any direct contact with the aluminium. “However our machines not only produce containers for pet food but also the most varied forms of aluminium receptacles for, among other things, preserves, pies or ground coffee”, explains Mathias Leuthold, who is responsible for the management of toolmaking and mechanical engineering in the family business. The company has also developed machines for entirely different substances such as fuel pastes or packaging for medical products such as inhalers. The aluminium raw material is carried to the presses in rolls. Such machines are used only to a very small extent in the company’s own production facility in Einsiedeln and these are mainly for test purposes and for further development of the machines. A considerably larger proportion is installed with HLM’s customers worldwide. “In addition to the domestic Swiss market, our customers are based in many European countries. But our machines are also in use, e.g., in the USA and Australia”, says Mathias Leuthold. The prerequisite for stamping out thin-walled containers, the dimensions of which can vary between 60 and 120 mm in width and between 60 and 200 mm in length, is high quality aluminium foil. The stamped-out containers are conveyed in line to the module-based built-in inspection and stacking machines. “If a customer has decided on us as his machine supplier, the first step as a rule is to send us some ideas, sketches and/or 3D models of his desired aluminium container. On this basis we will then develop the whole machine, from the design of the container or casing through the tool and checking module to the stacking unit, or adapt our standard machines to the customer’s wishes”, explains the engineer describing the usual path from the idea to the finished machine. Four finished cat food trays are produced per stroke from the aluminium strips and then are blown out and conveyed onwards on transport belts and mechanical tracks. After the containers have been brought into the finished shape by a single stroke in the press, they are blown out and transported in-line by means of transport belts and mechanical tracks to the modules where quality control is carried out. The machine module for quality control consists of four parallel lines with offset imaging stations. The LED lighting and the cameras on each track are triggered by a light barrier. The cameras of type Genie Nano by Teledyne DALSA located under the transport tracks take pictures of the containers in the transmitted light procedure. Two opened modules on the latest generation of machines: The cameras are mounted below the transport tracks; the lighting above it. The monitor can be seen on the upper edge of the picture. This facility is implemented by means of a ring buffer, which saves the last 20 defect images in the embedded system and displays them on demand. In addition to images of current results, the user can also view statistics about types of defects and their frequency, the distribution of rejects across the different tracks and also images of defective containers very easily, directly on the machine’s display. “This contributes significantly to faster rectification of defects by means of appropriate mechanical adjustments to the machine”, emphasises Mathias Leuthold. From an economics point of view, the costs of the earlier intelligent camera systems were roughly on the same level as those of the embedded PC systems of the new generation of machines, however the additional benefits tipped the scales in favour of the embedded PC based solution. STEMMER IMAGING has delivered all components to us already pre-configured and tested, which has considerably reduced our expenditure in implementing the machine. HLM does not employ its own machine vision specialists. “Although we have already been using this technology for around 20 years and have accumulated some experience in this matter, we have nevertheless been relying on the know-how and informed advice of our partner, STEMMER IMAGING, for many years", Mathias Leuthold pointed out. According to his statement this also applies particularly to the recently implemented changeover to embedded PC-based systems, where the Swiss subsidiary of STEMMER IMAGING was concerned primarily with the optimum selection of all machine vision components. A feasibility study then led to a recommendation of which imaging products are best suited to the new generation of machines. One camera of type Genie Nano by Teledyne DALSA per transport track provides perfect pictures of the containers. A LED light is mounted on the cover of a testing station, shown here opened. In the new generation of machines, there is a Genie Nano camera, made by Teledyne DALSA, installed on every line. This is triggered by light barriers. Equipped with suitable optics from Lensation, these cameras are located underneath the transport tracks. The deciding factor for selecting the Genie Nano was the fact that these cameras met all the requirements with respect to performance, resolution and speed and furthermore were attractive from a price point of view. The LED lighting, which is also triggered by light barriers, is integrated above the testing stations in the machines, so that the containers can be inspected in the transmitted light procedure. It was developed by STEMMER IMAGING specially for the present requirements. A certain size and a defined lighting angle are required for this application. “There is no standard lighting that meets these requirements, so in this case we have developed customer-specific lighting for Leuthold Mechanik”, says Claudio Sager, Managing Director of the Swiss subsidiary of STEMMER IMAGING, to justify this step. The embedded PC, which undertakes the evaluation of all the images from the four lines and also handles the control of the machine by means of the so-called Real Time Manager, is a custom product from the Swiss electronics manufacturer, Worx. It has to manage a considerable amount of computing power. With this machine it must evaluate 120 images per minute and track, and forward the results to the discharge station in the shortest time possible so that defective containers can be separated out immediately. The images are evaluated using the Common Vision Blox (CVB) imaging software from STEMMER IMAGING. At the end of the line the inspected containers are stacked by the machine and then manually packaged. “Even with this central component, the applications know-how of STEMMER IMAGING was decisive in finding the perfect solution for us”, Mathias Leuthold praises the collaboration with his machine vision partner. According to him, good cooperation with Worx, where the installation of the software and the programming of the embedded PC were carried out exactly in accordance with Leuthold Mechanik’s specifications, was also important. Currently the engineer and his colleagues are completing the second machine of the new PC-based generation which, after training in machine operation, will start production in a few days at a customer’s premises in Austria. “And many more will follow”, Leuthold is certain. As a global leader in the manufacture of machines for the production of thin-walled aluminium packaging, HLM Leuthold Mechanik AG has been delivering top precision in the field of mechanical, equipment and tool engineering since 1978. A wide range of companies, from upmarket enterprises in the automotive and aircraft industry to quality-conscious companies in the medical sector and the food and packaging industry, have been relying on HLM’s products and services. Screenshot with a detected defect on Track Number 4. Defective containers and other aluminium scrap are collected in order to recycle the material. The end product of this machine: Aluminium cat food trays. [...] the applications know-how of STEMMER IMAGING was decisive in finding the perfect solution for us.